Coconut can be consumed in many different forms, and it can have a variety of benefits for people with diabetes. The coconut has great versatility, and it can form part of many people’s daily diets. It is highly nutritious and rich in fibre, vitamins and minerals, and it provides the majority of the food eaten on many islands worldwide. A coconut is actually a one-seeded drupe, not a nut, nor a fruit. Coconuts are generally regarded as having a number of advantageous for people with diabetes. Coconuts are high in naturally occurring saturated fat from short and medium chain fatty acids (MCFAs) such as lauric acid. Lauric acid is converted in the body into monolaurin , a beneficial compound that destroys a wide variety of organisms that cause disease. It is used to fight common colds and viral infections, such as the flu. The more fluid form of coconut milk typically has no more calories than semi-skimmed milk. However, there are more calories in the thicker form of coconut milk, and caution may need to be exercised in regard to portion sizes. Furthermore, some forms of thicker coconut milk are heavily processed and include emulsifies, which might be bad for gut health and increase the risk of obesity and metabolic syndrome. Coconut flour is rich in dietary fibre, which can help reduce the risk of developing heart disease and lower cholesterol levels. As it is low in carbohydrate compared to flours such as wheat and corn, it is useful for people with diabetes because it has a mild impact on blood glucose levels. It is also gluten free, which makes it an ideal option for people with celiac disease – an autoimmune disease which people with type 1 diabetes are more at risk of developing. Furthermore, coconut flour is a good source of protein, which keeps you full for longer and is valuable for cell repair and growth. Coconut oil has known health properties when applied to the skin, but it can also have benefits when used - in a similar way to butter - as part of our diet. Small scale research  indicates that coconut oil may help with reducing waist circumference, reducing insulin resistance and raising levels of HDL cholesterol (good cholesterol). However, the research is not conclusive enough to state that coconut oil is indeed beneficial in terms of reducing obesity, insulin resistance or heart disease. Coconut oil also has about 20 per cent more calories than the same quantity of butter. Coconut water is often touted as the perfect hangover remedy as it is naturally refreshing and full of electrolytes (salts and minerals) that can settle nausea and/or vomiting. Coconut water is the clear liquid from young green coconuts. 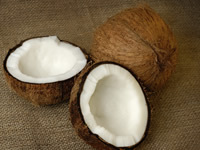 As it is largely water and does not contain coconut flesh, it has negligible fat content and is very low in calories.